These are the perfect surfaces for germs to accumulate on and need special attention to ensure that no contamination of foodstuffs occurs. Kill germs and get rid of any grime by washing your countertops and cutting boards with a soapy solution made with 1 tablespoon of MAQ Multipurpose Thick Bleach mixed with 2 litres of water. Appliances – especially those you use often – can quickly become hotspots for grease and grime. Unplug your electrics before wiping them down with MAQ Multipurpose Cream Cleaner. You can also use the grease stripping properties of MAQ Dishwashing Liquid to wipe down these handy kitchen helpers – remember, never wash them in water; instead, use a damp cloth dotted with the dishwashing liquid to clean their surfaces. What’s more, you can also use any leftover MAQ Dishwashing Liquid – with its powerful and deep-cleaning formula – to cut through grease and grime on all of your dishes, pots and pans. And don’t forget the fridge! Clean it inside and out with MAQ Multipurpose Cream Cleaner once you’ve finished with the gadgets. Your stovetop has never been cleaner! For burnt-on food spills, you only need undiluted MAQ Multipurpose Cream Cleaner to solve the problem. Leave the cleaner on the mark for a couple of minutes and then simply wipe the grime away. Keeping the kitchen floor spotless may seem like a never-ending job. Luckily, with MAQ Multipurpose Cream Cleaner, you can easily scrub away dirt and grime for a kitchen that’s pristine from top to bottom. For a really deep cleanse, use MAQ Multipurpose Thick Bleach and an old toothbrush to clean the grout between tiles and, once you’re done, use a dilution of the bleach to disinfect the floor – an especially good idea in the kitchen! 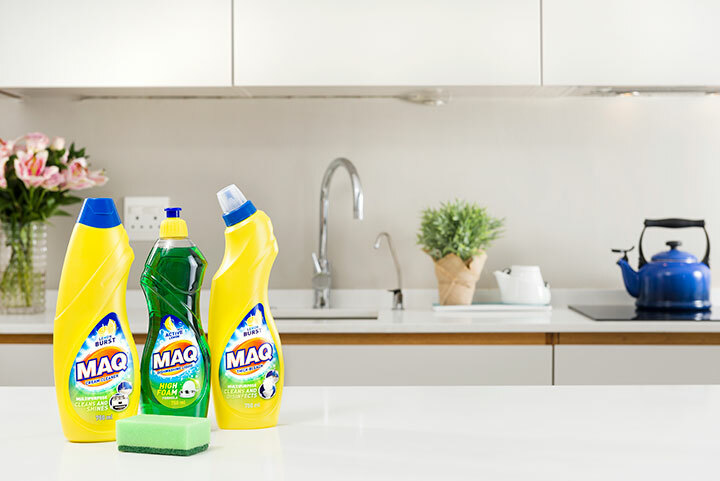 MAQ Dishwashing Liquid has the power of active lemons for a richer, long-lasting foam that easily removes grease. MAQ Multipurpose Cream Cleaner contains an active detergent and soft abrasive to loosen and lift dirt, leaving surfaces shiny and scratch free. MAQ Multipurpose Thick Bleach combines an effective detergent with bleach to clean thoroughly, as well as disinfect for 24-hour protection against germs. WIN! One lucky reader will stand the chance to win a Le Creuset voucher worth R10 000! To enter, simply answer the question: How many times does the word “MAQ” appear on the front and back of the MAQ Multipurpose Thick Bleach bottle? Competition closes on 30 November 2018. Ts&Cs apply.